To find Christmas gifts for family members is often not easy, particularly not for children and adolescents. After all, they want to surprise the recipient with an original gift, which preferably does not cost too much either. 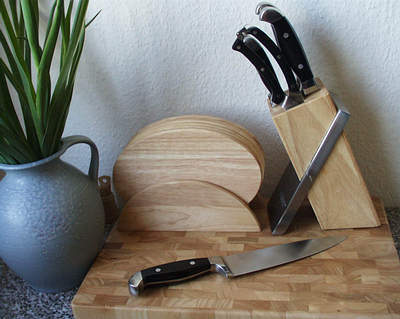 Therefore, a self-made knife block for the kitchen is indeed an unusual gift. There are two different ways to make such a knife block, which at the same time are not that expensive either. For this kind of knife block, you need five plywood boards and several bamboo skewers. For the first step, the casing of the knife block is made. You need to glue the side walls together so that you get a rectangular box. The walls can be secured with clamps until the glue has dried. Subsequently, the bottom board is fixed to the casing. The floor board should have 20mm margin, bigger than the actual size. To give the bottom a good hold, weigh it down with a stone while the glue dries. Taking bundles of bamboo skewers and pull them over sandpaper to round up the tips. Next the bamboo skewers are stuck into the frame of the knife block with the rounded tips up. How many skewers you need is easy to calculate: The knives should have sufficient space while they should have a good hold at the same time. Finally, the plywood under the knife block can be painted and decorated as desired. First determine the measurements of the knife block. To do so, put all knives next to each other and measure them at their widest point. Then add a margin of 2mm on all sites. In addition, add for a gap of two centimetres and one centimetre from the right and left alike. For the length, measure the longest knife and add another centimetre. To make it easier, buy all the materials only after you have all the measurements, because this way, you can get the plywood cut at the hardware store. From this 2cm bar cut off a piece from the overall length, then saw it in half, so that you have two pieces of each 1cm. The remaining parts are cut in equals parts with the same length. Now draw on the 18mm wood panel your measurements. Then make lines of a 90degree angle to the edges. Now put a bit of glue on one side of the bars and press it into the space provided on the panel and fasten it with a pair of pliers. Make sure that the strips do not slip on the glue. Then the strips are glued to the other side, and the 9mm thick panel is placed on top. Once again, fasten everything with pliers. After a few hours when the glue had dried, smoothen all sides with sandpaper and slightly round up the edges. After the first sanding down, wet the surface with a sponge, then sand it again. If the knife block is well dried, rub linseed oil on it to give it a sophisticated look. Finally, one of the about mentioned mounting options is put into place. All that is left is to hang the knife block up in its designated location. The sketch here is just one example. 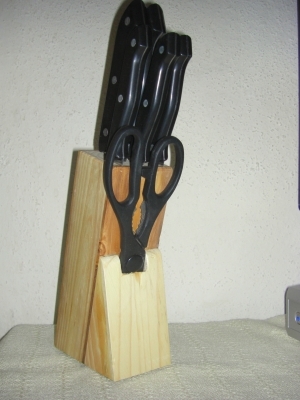 Of course, you can place more knives next to each other, or create multiple blocks and then glue them together. If you stick several blocks together to form a large block, then rather choose only one 18mm multiplex bar to organize the row of knives better. Also, a large knife block you do not hang up but stands on the kitchen counter top.